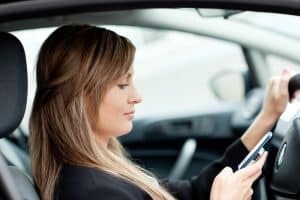 Mississippi Leads the Country in Distracted Driving Collisions | Merkel & Cocke, P.A. Distracted driving is dangerous; we all know this. There are billboards and radio ads warning against it. There is research and data that supports it. We have written about the dangers ourselves, and represented clients who have sustained horrific injuries as a result of it. Yet every day, people are dying as a result of distracted driving. By and large, cell phone usage is the greatest distraction there is. Texting and driving is a real problem, but it is not the only one: using your smartphone for a GPS, or scrolling through social media sites, or trying to access a playlist is just as dangerous. In fact, even talking on the phone can increase your risk of a crash. Distracted driving also includes operators who drive while intoxicated or who drive while tired. Drivers who aren’t in control of the vehicle are a danger to passengers, other drivers, and anyone on or near the roadways. 25% of those surveyed admitted that their own use of technology was dangerous. 47% of drivers feel comfortable to text while they drive, or to use voice controls. Teenage drivers are especially prone to drive while distracted. Many teens are just not mature enough to appreciate how deadly or serious an accident can be. They mistakenly think their reflexes and youth can help them get out of traffic jams. If you were injured or a loved one was killed in a Mississippi car accident, the lawyers at Merkel & Cocke, PA have the experience you need to protect you. For help with you distracted driver claim, please call us at 662.799.1633 or use our contact form. We serve the entire Gulf Coast region from our law offices in Clarksdale, Oxford, and Jackson.